Thorstein Bunde Veblen (/ˈθɔːrstaɪn ˈvɛblən/; born Torsten Bunde Veblen; July 30, 1857 – August 3, 1929) was an American economist and sociologist who became famous as a witty critic of capitalism. Veblen is known for the idea of "conspicuous consumption". People engage in conspicuous consumption, along with "conspicuous leisure", to demonstrate wealth or to mark social status. Veblen explains the concept in his best-known book, The Theory of the Leisure Class (1899). Historians of economic thought regard Veblen as the leader of the institutional economics movement. Contemporary economists still call Veblen's distinction between "institutions" and "technology" the Veblenian dichotomy. As a leading intellectual of the Progressive Era in the United States of America, Veblen attacked production for profit. His emphasis on conspicuous consumption greatly influenced the socialist thinkers who engaged in non-Marxist critiques of capitalism and of technological determinism. Veblen was born on July 30, 1857, in Cato, Wisconsin, to Norwegian American immigrant parents, Thomas Veblen and Kari Bunde. He was the fourth of twelve children in the Veblen family. His parents emigrated from Norway to Milwaukee, Wisconsin on September 16, 1847, with little funds and no knowledge of English. Despite their limited circumstances as immigrants, Thomas Veblen's knowledge in carpentry and construction paired with his wife's supportive perseverance allowed them to establish a family farm, which is now a National Historic Landmark, in Nerstrand, Minnesota. This farmstead and other similar settlements were referred to as little Norways, oriented by the religious and cultural traditions of the old country. The farmstead was also where Veblen spent most of his childhood. Veblen began his schooling at the age of five. Since Norwegian was his first language, he learned English from neighbors and at school. His parents also learned to speak English fluently, though they continued to read predominantly Norwegian literature with and around their family on the farmstead. The family farm eventually grew more prosperous, allowing Veblen's parents to provide their children with formal education. Unlike most immigrant families of the time, Veblen and all of his siblings received training in lower schools and went on to receive higher education at the nearby Carleton College. Veblen's sister, Emily, was recognized as the first daughter of Norwegian immigrants to graduate from an American college. The eldest Veblen child, Andrew A. Veblen, ultimately became a professor of physics at Iowa State University and the father of one of America's leading mathematicians, Oswald Veblen of Princeton University. Several critics have argued that Veblen's Norwegian background and his relative isolation from American society are essential to the understanding of his writings. Sociologist and educator David Riesman maintains that his background as a child of immigrants meant that Veblen was alienated from his parents' previous culture, but that his living in a Norwegian society within America made him unable to completely "assimilate and accept the available forms of Americanism". According to George M. Fredrickson the Norwegian society Veblen lived in was so isolated that when he left it "he was, in a sense, emigrating to America". At age 17, in 1874, Veblen was sent to attend nearby Carleton College in Northfield, Minnesota. Early in his schooling, he demonstrated both the bitterness and the sense of humor that would characterize his later works. Veblen studied economics and philosophy under the guidance of the young John Bates Clark (1847–1938), who went on to become a leader in the new field of neoclassical economics. Clark's influence on Veblen was great, and as Clark initiated him into the formal study of economics, Veblen came to recognize the nature and limitations of hypothetical economics that would begin to shape his theories. Veblen later developed an interest in the social sciences, taking courses within the fields of philosophy, natural history, and classical philology. Within the realm of philosophy, the works of Immanuel Kant and Herbert Spencer were of greatest interest to him, inspiring several preconceptions of socio-economics. In contrast, his studies in natural history and classical philology shaped his formal use of the disciplines of science and language respectively. After Veblen graduated from Carleton in 1880 he traveled east to study philosophy at Johns Hopkins University. While at Johns Hopkins he studied under Charles Sanders Peirce. When he failed to obtain a scholarship there he moved on to Yale University, where he found economic support for his studies, obtaining a Ph.D. in 1884, with a major in philosophy and a minor in social studies. His dissertation was titled "Ethical Grounds of a Doctrine of Retribution". At Yale, he studied under renowned academics such as philosopher Noah Porter and sociologist William Graham Sumner. After graduation from Yale in 1884, Veblen was essentially unemployed for seven years. Despite having strong letters of recommendation, he was unable to obtain a university position. It is possible that his dissertation research on "Ethical Grounds of a Doctrine of Retribution" (1884) was considered undesirable. However this possibility can no longer be researched because Veblen's dissertation has been missing from Yale since 1935. Apparently the only scholar who ever studied the dissertation was Joseph Dorfman, for his 1934 book Thorstein Veblen and His America. Dorfman says only that the dissertation, advised by evolutionary sociologist William Graham Sumner, studies such evolutionary thought as that of Herbert Spencer, as well as the moral philosophy of Kant. Some historians have also speculated that this failure to obtain employment was partially due to prejudice against Norwegians, while others attribute this to the fact that most universities and administrators considered him insufficiently educated in Christianity. Most academics at the time held divinity degrees, which Veblen did not have. Also, it did not help that Veblen openly identified as an agnostic, which was highly uncommon for the time. As a result, Veblen returned to his family farm, a stay during which he had claimed to be recovering from malaria. He spent those years recovering and reading voraciously. It is suspected that these difficulties in beginning his academic career later inspired portions of his book The Higher Learning in America (1918), in which he claimed that true academic values were sacrificed by universities in favor of their own self-interest and profitability. In 1891, Veblen left the farm to return to graduate school to study economics at Cornell University, under the guidance of economics professor James Laurence Laughlin. With the help of Professor Laughlin, who was moving to the University of Chicago, Veblen became a fellow at that university in 1892. Throughout his stay, he did much of the editorial work associated with the Journal of Political Economy, one of the many academic journals created during this time at the University of Chicago. Veblen used the journal as an outlet for his writings. His writings also began to appear in other journals, such as the American Journal of Sociology, another journal at the university. While he was mostly a marginal figure at the University of Chicago, Veblen taught a number of classes there. In 1899, Veblen published his first and best-known book, titled The Theory of the Leisure Class. This did not immediately improve Veblen's position at the University of Chicago. He requested a raise after the completion of his first book, but this was denied. Eventually, as the book received attention, Veblen was promoted to the position of assistant professor. Struggling at the University of Chicago, Veblen accepted a position of associate professor at Stanford University. Veblen's students at Chicago considered his teaching "dreadful". Stanford students considered his teaching style "boring". But this was more excusable than some of Veblen's personal affairs. He offended Victorian sentiments with extramarital affairs while at the University of Chicago. At Stanford in 1909, Veblen was ridiculed again for being a womanizer and an unfaithful husband. As a result, he was forced to resign from his position, which made it very difficult for him to find another academic position. One story claims that he was fired from Stanford after Mrs. Leland Stanford sent him a telegram from Paris, having disapproved of Veblen's support of Chinese "coolie" workers in California. With the help of Herbert J. Davenport, a friend who was the head of the economics department at the University of Missouri, Veblen accepted a position there in 1911. Veblen, however, did not enjoy his stay at Missouri. This was in part due to his position as a lecturer being of lower rank than his previous positions and for lower pay. Veblen also strongly disliked the town of Columbia, where the university was located. Although he may not have enjoyed his stay at Missouri, in 1914 he did publish another of his best-known books, The Instincts of Worksmanship and the State of the Industrial Arts (1914). After World War I began, Veblen published Imperial Germany and the Industrial Revolution (1915). He considered warfare a threat to economic productivity and contrasted the authoritarian politics of Germany with the democratic tradition of Britain, noting that industrialization in Germany had not produced a progressive political culture. By 1917, Veblen moved to Washington, D.C. to work with a group that had been commissioned by President Woodrow Wilson to analyze possible peace settlements for World War I, culminating in his book An Inquiry into the Nature of Peace and the Terms of Its Perpetuation (1917). This marked a series of distinct changes in his career path. Following that, Veblen worked for the US Food Administration for a period of time. Shortly thereafter, Veblen moved to New York City to work as an editor for a magazine, The Dial. Within the next year, the magazine shifted its orientation and he lost his editorial position. In the meantime, Veblen had made contacts with several other academics, such as Charles A. Beard, James Harvey Robinson, and John Dewey. The group of university professors and intellectuals eventually founded The New School for Social Research (known today as The New School) in 1919 as a modern, progressive, free school where students could "seek an unbiased understanding of the existing order, its genesis, growth, and present working". From 1919 to 1926, Veblen continued to write and maintain a role in The New School's development. It was during this time that he wrote The Engineers and the Price System. In it, Veblen proposed a soviet of engineers. According to Yngve Ramstad, the view that engineers, not workers, would overthrow capitalism was a "novel view". Veblen invited Guido Marx to the New School to teach and to help organize a movement of engineers, by such as Morris Cooke; Henry Laurence Gantt, who had died shortly before; and Howard Scott. Cooke and Gantt were followers of Taylor's scientific management theory. Scott, who listed Veblen as being on the temporary organizing committee of the Technical Alliance, perhaps without consulting Veblen or other listed members, later helped found the Technocracy movement. Veblen had a penchant for socialism and believed that technological developments would eventually lead toward a socialistic organization of economic affairs. However, his views on socialism and the nature of the evolutionary process of economics differed sharply from that of Karl Marx; while Marx saw socialism as the final political precursor to communism, the ultimate goal for civilization, and saw the working class as the group that would establish it, Veblen saw socialism as one intermediate phase in an ongoing evolutionary process in society that would be brought about by the natural decay of the business enterprise system and by the inventiveness of engineers. Daniel Bell sees an affinity between Veblen and the Technocracy movement. Janet Knoedler and Anne Mayhew demonstrate the significance of Veblen's association with these engineers, while arguing that his book was more a continuation of his previous ideas than the advocacy others see in it. The German Historical School rejected the individual as its unit of analysis, instead searching for a more holistic unit of analysis, which inspired Veblen to do the same. The School and Veblen alike preferred this inclusive unit of analysis to ask how and why human behavior evolves throughout history. The skepticism of the School regarding laissez-faire economics was also adopted by Veblen. Veblen was deeply influenced by the Darwinian belief in the principle of causality. Unlike the German School, Darwin's theories were systematically connected and explained series of seemingly disconnected phenomena throughout life. He developed a theoretical system of his own, inspired by Darwin's theories, which recognized natural and observable forces, rather than divine and teleological ones. With this, Veblen also critiqued the neoclassical beliefs of economics, which stated that economics were passive and essentially inert. Upon this critique, Veblen built his theories of economics. American pragmatists distrusted the notion of the absolute and instead recognized the notion of free will. Rather than God's divine intervention taking control of the happenings of the universe, pragmatism believed that people, using their free will, shape the institutions of society. Veblen also recognized this as an element of causes and effects, upon which he based many of his theories. This pragmatist belief was pertinent to the shaping of Veblen's critique of natural law and the establishment of his evolutionary economics, which recognized the purpose of man throughout. Veblen concurred with Marx in that there existed a few parasitic owners of the means of production in society who used means of exploitation to maintain that control. While Marx saw the proletariat as rising up against the ruling class, Veblen believed that the proletariat would instead emulate the ruling class. This belief served as the basis for Veblen's theory of conspicuous consumption. Overall, Veblen held Marx's economic theories in a high regard. Veblen and Marx also shared similar ideas regarding the importance of technology in provoking social change. Thorstein Veblen laid the foundation for the perspective of institutional economics with his criticism of traditional static economic theory. As much as Veblen was an economist, he was also a sociologist who rejected his contemporaries who looked at the economy as an autonomous, stable, and static entity. Veblen disagreed with his peers, as he strongly believed that the economy was significantly embedded in social institutions. Rather than separating economics from the social sciences, Veblen viewed the relationships between the economy and social and cultural phenomena. Generally speaking, the study of institutional economics viewed economic institutions as the broader process of cultural development. While economic institutionalism never transformed into a major school of economic thought, it allowed economists to explore economic problems from a perspective that incorporated social and cultural phenomena. It also allowed economists to view the economy as an evolving entity of bounded rationale. In his most famous work, The Theory of the Leisure Class, Veblen writes critically of the leisure class for its role in fostering wasteful consumption. In this first work Veblen coined the term "conspicuous consumption", which he defined as spending more money on goods than they are worth. The term originated during the Second Industrial Revolution when a nouveau riche social class emerged as a result of the accumulation of capital wealth. He explains that members of the leisure class, often associated with business, are those who also engage in conspicuous consumption in order to impress the rest of society through the manifestation of their social power and prestige, be it real or perceived. In other words, social status, Veblen explained, becomes earned and displayed by patterns of consumption rather than what the individual makes financially. Subsequently, people in other social classes are influenced by this behavior and, as Veblen argued, strive to emulate the leisure class. What results from this behavior, is a society characterized by the waste of time and money. Unlike other sociological works of the time, The Theory of the Leisure Class focused on consumption, rather than production. Conspicuous leisure, or the non-productive use of time for the sake of displaying social status, is used by Veblen as the primary indicator of the leisure class. To engage in conspicuous leisure is to openly display one's wealth and status, as productive work signified the absence of pecuniary strength and was seen as a mark of weakness. As the leisure class increased their exemption from productive work, that very exemption became honorific and actual participation in productive work became a sign of inferiority. Conspicuous leisure worked very well to designate social status in rural areas, but urbanization made it so that conspicuous leisure was no longer a sufficient means to display pecuniary strength. Urban life requires more obvious displays of status, wealth, and power, which is where conspicuous consumption becomes prominent. In The Theory of the Leisure Class, Veblen writes critically of conspicuous consumption and its function in social-class consumerism and social stratification. Reflecting historically, he traces said economic behaviors back to the beginnings of the division of labor, or during tribal times. Upon the start of a division of labor, high-status individuals within the community practiced hunting and war, notably less labor-intensive and less economically productive work. Low-status individuals, on the other hand, practiced activities recognized as more economically productive and more labor-intensive, such as farming and cooking. High-status individuals, as Veblen explains, could instead afford to live their lives leisurely (hence their title as the leisure class), engaging in symbolic economic participation, rather than practical economic participation. These individuals could engage in conspicuous leisure for extended periods of time, simply following pursuits that evoked a higher social status. Rather than participating in conspicuous consumption, the leisure class lived lives of conspicuous leisure as a marker of high status. The leisure class protected and reproduced their social status and control within the tribe through, for example, their participation in war-time activities, which while they were rarely needed, still rendered their lower social class counterparts dependent upon them. During modern industrial times, Veblen described the leisure class as those exempt from industrial labor. Instead, he explains, the leisure class participated in intellectual or artistic endeavors to display their freedom from the economic need to participate in economically productive manual labor. In essence, not having to perform labor-intensive activities did not mark higher social status, but rather, higher social status meant that one would not have to perform such duties. The central problem for Veblen was the friction between "business" and "industry". Veblen identified "business" as the owners and leaders whose primary goal was the profits of their companies but, in an effort to keep profits high, often made efforts to limit production. By obstructing the operation of the industrial system in that way, "business" negatively affected society as a whole (through higher rates of unemployment, for example). 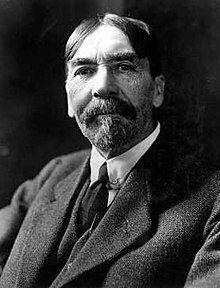 With that said, Veblen identified business leaders as the source of many problems in society, which he felt should be led by people such as engineers, who understood the industrial system and its operation, while also having an interest in the general welfare of society at large. Veblen and other American institutionalists were indebted to the German Historical School, especially Gustav von Schmoller, for the emphasis on historical fact, their empiricism and especially a broad, evolutionary framework of study. Veblen admired Schmoller, but criticized some other leaders of the German school because of their overreliance on descriptions, long displays of numerical data and narratives of industrial development that rested on no underlying economic theory. Veblen tried to use the same approach with his own theory added. Probably the clearest inheritors of Veblen's ideas that humans do not rationally pursue value and utility through their conspicuous consumption are adherents of the school of behavioral economics, who study the ways consumers and producers act against their own interests in apparently non-rational ways. Veblen developed a 20th century evolutionary economics based upon Darwinian principles and new ideas emerging from anthropology, sociology, and psychology. Unlike the neoclassical economics that emerged at the same time, Veblen described economic behavior as socially determined and saw economic organization as a process of ongoing evolution. Veblen rejected any theory based on individual action or any theory highlighting any factor of an inner personal motivation. According to him, such theories were "unscientific". This evolution was driven by the human instincts of emulation, predation, workmanship, parental bent, and idle curiosity. Veblen wanted economists to grasp the effects of social and cultural change on economic changes. In The Theory of the Leisure Class, the instincts of emulation and predation play a major role. People, rich and poor alike, attempt to impress others and seek to gain advantage through what Veblen termed "conspicuous consumption" and the ability to engage in "conspicuous leisure". In this work Veblen argued that consumption is used as a way to gain and signal status. Through "conspicuous consumption" often came "conspicuous waste", which Veblen detested. He further spoke of a "predatory phase" of culture in the sense of the predatory attitude having become the habitual spiritual attitude of the individual. In The Theory of Business Enterprise, published in 1904 during the height of American concern with the growth of business combinations and trusts, Veblen employed his evolutionary analysis to explain these new forms. He saw them as a consequence of the growth of industrial processes in a context of small business firms that had evolved earlier to organize craft production. The new industrial processes impelled integration and provided lucrative opportunities to those who managed it. What resulted was, as Veblen saw it, a conflict between businessmen and engineers, with businessmen representing the older order and engineers as the innovators of new ways of doing things. In combination with the tendencies described in The Theory of the Leisure Class, this conflict resulted in waste and "predation" that served to enhance the social status of those who could benefit from predatory claims to goods and services. Veblen generalized the conflict between businessmen and engineers by saying that human society would always involve conflict between existing norms with vested interests and new norms developed out of an innate human tendency to manipulate and learn about the physical world in which we exist. He also generalized his model to include his theory of instincts, processes of evolution as absorbed from Sumner, as enhanced by his own reading of evolutionary science, and pragmatic philosophy first learned from Peirce. The instinct of idle curiosity led humans to manipulate nature in new ways and this led to changes in what he called the "material means of life". Because, according to the pragmatists, our ideas about the world are a human construct rather than mirrors of reality, changing ways of manipulating nature lead to changing constructs and to changing notions of truth and authority as well as patterns of behavior (institutions). Societies and economies evolve as a consequence, but do so via a process of conflict between vested interests and older forms and the new. Veblen never wrote with any confidence that the new ways were better ways, but he was sure, in the last three decades of his life, that the American economy could, in the absence of vested interests, have produced more for more people. In the years just after World War I he looked to engineers to make the American economy more efficient. In addition to The Theory of the Leisure Class and The Theory of Business Enterprise, Veblen's monograph Imperial Germany and the Industrial Revolution, and his many essays, including "Why is Economics Not an Evolutionary Science", and "The Place of Science in Modern Civilization", remain influential. Politically, Veblen was sympathetic to state ownership. Scholars mostly disagree about the extent to which Veblen's views are compatible with Marxism, socialism, or anarchism. Veblen believed that technological developments would eventually lead to a socialist economy, but his views on socialism and the nature of the evolutionary process of economics differed sharply from Karl Marx's. Veblen saw socialism as an intermediate phase in an ongoing evolutionary process that would arise due to natural decay of the business enterprise system. The two primary relationships that Veblen had were with his first two wives, although he was known to engage in extramarital affairs throughout his life. During his time at Carleton, Veblen met his first wife, Ellen Rolfe, the niece of the college president. They married in 1888. While some scholars have attributed his womanizing tendencies to the couple's numerous separations and eventual divorce in 1911, others have speculated that the relationship's demise was rooted in Ellen's inability to bear children. Following her death in 1926, it was revealed that she had asked for her autopsy to be sent to Veblen, her ex-husband. The autopsy showed that Ellen's reproductive organs had not developed normally, and she had been unable to bear children. A book written by Veblen's stepdaughter asserted that "this explained her disinterest in a normal wifely relationship with Thorstein" and that he "treated her more like a sister, a loving sister, than a wife". Veblen married Ann Bradley Bevans, a former student, in 1914 and became stepfather to her two girls, Becky and Ann. For the most part, it appears that they had a happy marriage. Ann was described by her daughter as a suffragette, a socialist, and a staunch advocate of unions and workers' rights. A year after he married Ann, they were expecting a child together, but the pregnancy ended in a miscarriage. Veblen never had any children of his own. After his wife Ann's premature death in 1920, Veblen became active in the care of his stepdaughters. Becky went with him when he moved to California, looked after him there, and was with him at his death in August 1929, just a few months shy of the Great Depression, the economic crisis he had anticipated in Absentee Ownership and Business Enterprise in Recent Times. Prior to his death, Veblen had earned a comparatively high salary from the New School. Since he lived frugally, Veblen invested his money in California raisin vineyards and the stock market. Unfortunately, after returning to northern California, Veblen lost the money he had invested and was living in a town shack while earning $500 to $600 a year from royalties and was sent $500 a year from a former Chicago student. In spite of his sometimes archaic language, caused in part by Veblen's struggles with the terminology of unilinear evolution and of biological determination of social variation that still dominated social thought when he began to write, Veblen's work remains relevant, and not simply for the phrase "conspicuous consumption". His evolutionary approach to the study of economic systems is again in vogue and his model of recurring conflict between the existing order and new ways can be of value in understanding the new global economy. The handicap principle of evolutionary sexual selection is often compared to Veblen's "conspicuous consumption". Veblen is regarded as one of the co-founders (with John R. Commons, Wesley Clair Mitchell, and others) of the American school of institutional economics. Present-day practitioners who adhere to this school organise themselves in the Association for Evolutionary Economics (AFEE) and the Association for Institutional Economics (AFIT). AFEE gives an annual Veblen-Commons award for work in Institutional Economics and publishes the Journal of Economic Issues. Some unaligned practitioners include theorists of the concept of "differential accumulation". Veblen is cited in works of feminist economists. Veblen's work has also often been cited in American literary works. He is featured in The Big Money by John Dos Passos, and mentioned in Carson McCullers' The Heart Is a Lonely Hunter and Sinclair Lewis's Main Street. One of Veblen's Ph.D. students was George W. Stocking, Sr., a pioneer in the emerging field of industrial organization economics. Another was Canadian academic and author Stephen Leacock, who went on to become the head of Department of Economics and Political Science at McGill University. The influence of Theory of the Leisure Class can be seen in Leacock's 1914 satire, Arcadian Adventures with the Idle Rich. — (1904). The Theory of Business Enterprise. New York: Charles Scribner's Sons. — (1914). The Instinct of Workmanship and the State of the Industrial Arts. New York: MacMillan. — (1915). Imperial Germany and the Industrial Revolution. New York: MacMillan. — (1918). The Higher Learning In America: A Memorandum On the Conduct of Universities By Business Men. New York: B. W. Huebsch. — (1919). The Vested Interests and the Common Man. New York: B. W. Huebsch. — (1921). The Engineers and the Price System. New York: B. W. Huebsch. — (1923). Absentee Ownership and Business Enterprise in Recent Times: The Case of America. New York: B. W. Huebsch. "Kant's Critique of Judgement", Journal of Speculative Philosophy, 1884. "Bohm-Bawerk's Definition of Capital and the Source of Wages", Quarterly Journal of Economics (QJE), 1892, . "The Economic Theory of Women's Dress", Popular Science Monthly, 1894. "Review of Karl Marx's Poverty of Philosophy", JPE, 1896. "Review of Werner Sombart's Sozialismus", JPE, 1897. "Review of Gustav Schmoller's Über einige Grundfragen der Sozialpolitik", JPE, 1898. "Review of Turgot's Reflections", JPE, 1898. "Why is Economics Not an Evolutionary Science? ", QJE, 1898. "The Beginnings of Ownership", American Journal of Sociology, 1898. "The Instinct of Workmanship and the Irksomeness of Labor", American Journal of Sociology, 1898. "The Barbarian Status of Women", American Journal of Sociology, 1898. "The Preconceptions of Economic Science", QJE1899 in JSTOR, and 1900. Part 1, Part 2, Part 3. "The Socialist Economics of Karl Marx and His Followers", (1906, 1907), QJE. "Fisher's Capital and Income", Political Science Quarterly, 1907. "Fisher's Rate of Interest", Political Science Quarterly, 1909. "The Blond Race and the Aryan Culture", Univ of Missouri Bulletin, 1913. "On the General Principles of a Policy of Reconstruction", J of the National Institute of Social Sciences, 1918. "Passing of National Frontiers", Dial, 1918. "Menial Servants during the Period of War", Public, 1918. "Farm Labor for the Period of War", Public, 1918. "The War and Higher Learning", Dial, 1918. "The Modern Point of View and the New Order", Dial, 1918. "On the Nature and Uses of Sabotage", Dial, 1919. "Bolshevism is a Menace to the Vested Interests", Dial, 1919. "The Captains of Finance and the Engineers", Dial, 1919. "The Industrial System and the Captains of Industry", Dial, 1919. The Place of Science in Modern Civilization and other essays, 1919. "Review of J.M.Keynes' Economic Consequences of the Peace, Political Science Quarterly, 1920. "Economic theory in the Calculable Future", AER, 1925. "Introduction" in The Laxdæla Saga, 1925. ^ a b Horowitz 2001, p. 142. ^ Tilman 1996, pp. 7-10. ^ Melton, William (1995). "Thorstein Veblen and the Veblens" (PDF). Norwegian-American Studies. 34. ^ Dobriansky 1957, pp. 6-9. ^ Riesman 1953, p. 206. ^ a b c Ritzer 2011, pp. 196-197. ^ a b c Ritzer 2011, p. 197. ^ a b Tilman 1996, p. 12. ^ Samuels, Warren (2002). The Founding of Institutional Economics. p. 225. ^ a b Ritzer 2011, p. 196. ^ Dobriansky 1957, p. 6. ^ Abercrombie, Hill & Turner 2006, pp. 409-410. ^ Tilman 1996, p. 27. ^ Sica 2005, p. 311. ^ Diggins 1978, p. 4. ^ a b Abercrombie, Hill & Turner 2006, p. 410. ^ Dobriansky 1957, p. 24. ^ "Which New Schooler Are You Most Like?". The New School. ^ Ritzer 2011, p. 14. ^ Wood 1993, p. 369: "The decisive difference between Marx and Veblen lay in their respective attitudes on socialism. For while Marx regarded socialism as the ultimate goal for civilization, Veblen saw socialism as but one stage in the economic evolution of society." ^ Knoedler & Mayhew 1999. ^ Duggar 1979, p. 426. ^ Duggar 1979, p. 429. ^ Dowd 1966, p. 106. ^ Duggar 1979, p. 432. ^ Dowd 1966, p. 24. ^ a b Hodgson 2004, pp. 125-194. ^ a b Diggins 1978. ^ Dowd 1966, p. 32. ^ Ritzer 2011, pp. 196-198. ^ Parker & Sim 1997, pp. 368-369. ^ Dowd 1966, pp. 25-27. ^ Diggins 1978, pp. 57-60. ^ Dowd 1966, p. 113. ^ Diggins 1978, p. 72-75. ^ Veblen, 1899 & holdithereA9The predatory phase of culture is attained only when the predatory attitude has become the habitual and accredited spiritual attitude for the members of the group; when the fight has become the dominant note in the current theory of life; when the common-sense appreciation of men and things has come to be an appreciation with a view to combat. ", Ch. 1. ^ Simich & Tilman 1982. ^ Dobriansky 1957, p. 12. ^ Tilman 1996, pp. 12-14. ^ a b Tilman 1996, pp. 14-15. ^ Diggins 1978, p. 10. ^ Jones, Ann (2019-04-11). "The Man Who Saw Trump Coming A Century Ago; A Reader's Guide for the Distraught". Tom Dispatch. Retrieved 2019-04-11. ^ Nitzan & Bichler 2002, Ch. 2. Abercrombie, Nicholas; Hill, Stephen & Turner, Bryan S. (2006). Dictionary of Sociology. London: Penguin Books. Adair, David (1970). The Technocrats 1919-1967: A Case Study of Conflict and Change in a Social Movement (PDF) (M.A.). Simon Fraser University. Retrieved 12 February 2015. Bell, Daniel (Autumn 1963). "Veblen and the New Class". The American Scholar. The Phi Beta Kappa Society. 32 (4): 616–638. JSTOR 41209141. Bell, Daniel (1980) [1st. pub. 1963]. "Veblen and the Technocrats: On the Engineers and the Price System". The Winding Passage: Sociological Essays and Journeys. Abt Books. Chavance, Bernard (2009). Institutional Economics. New York: Routledge. ISBN 9780415449113. Diggins, John P. (1978). The Bard of Savagery: Thorstein Veblen and Modern Social Theory. New York: Seabury Press. Dobriansky, Lev (1957). Veblenism: A New Critique. Washington, DC: Public Affairs Press. Dorfman, Joseph (1934). Thorstein Veblen and His America. New York: Viking Press. Dowd, Douglas (1966). Thorstein Veblen. New York: Transaction. Duggar, William M. (December 1979). "The Origins of Thorstein Veblen's Thought". Social Science Quarterly. University of Texas Press. 60 (3): 424–431. Fredrickson, George M. (Autumn 1959). "Thorstein Veblen: The Last Viking". American Quarterly. 11 (3): 403–415. doi:10.2307/2710392. Hodgson, Geoffrey M. (2004). The Evolution of Institutional Economics: Agency, Structure, and Darwinism in American Institutionalism. New York: Routledge. Horowitz, Irving Louis, ed. (2001). Veblen's Century: A Collective Portrait. New Brunswick, N.J.: Transaction. ISBN 978-0-7658-0099-2. Knoedler, Janet & Mayhew, Anne (Summer 1999). "Thorstein Veblen and the Engineers: A Reinterpretation". History of Political Economy. 31 (2): 255–272. doi:10.1215/00182702-31-2-255. Mayhew, Anne (1999). "Institutional Economics". In Peterson, Janice & Lewis, Margaret (eds.). The Elgar Companion To Feminist Economics. Edward Elgar Publishing. doi:10.4337/9781843768685.00063. Nitzan, Jonathan & Bichler, Shimshon (2002). The Global Political Economy of Israel. Pluto Press. Retrieved 13 February 2015. Parker, Noel & Sim, Stuart, eds. (1997). The A-Z Guide to Modern Social and Political Theorists. London: Prentice Hall/Harvester Wheatsheaf. Ramstad, Yngve (1994). "Veblen, Thorstein". In Hodgson, Geoffrey M.; Samuels, Warren J. & Tool, Marc R. (eds.). The Elgar Companion To Institutional And Evolutionary Economics. Edward Elgar Publishing. doi:10.4337/9781843768661.00169. Riesman, David (1953). Thorstein Veblen. New York: Charles Scribner's Sons. ISBN 0844667560. Ritzer, George (2011). Sociological Theory (8th ed.). New York: McGraw-Hill. ISBN 9780078111679. Rutherford, Malcolm (1980). "Veblen on owners, managers, and the control of industry". History of Political Economy. 12 (3): 434–440. doi:10.1215/00182702-12-3-434. Sica, Alan, ed. (2005). Social Thought: From the Enlightenment to the Present. Boston, MA: Pearson Education. Simich, J. L. & Tilman, Rick (1982). "Thorstein Veblen and his Marxist Critics: An Interpretive Review". History of Political Economy. 14 (3): 323–341. doi:10.1215/00182702-14-3-323. Retrieved 27 January 2015. Tilman, Rick (1992). Thorstein Veblen and His Critics, 1891-1963:Conservative, Liberal, and Radical Perspectives. Princeton University Press. Tilman, Rick (1996). The Intellectual Legacy of Thorstein Veblen: Unresolved Issues. Westport, CT: Greenwood Press. Veblen, Thorstein (1898). "Why is Economics Not an Evolutionary Science?". The Quarterly Journal of Economics. 12: 373. doi:10.2307/1882952. Veblen, Thorstein (1899). The Theory of the Leisure Class: An Economic Study of Institutions. New York: MacMillan. Veblen, Thorstein (November 1901). "Gustav Schmoller's Economics". The Quarterly Journal of Economics. 16 (1): 69–93. doi:10.2307/1882903. Waller, Jr., William T. (September 1982). "The Evolution of the Veblenian Dichotomy: Veblen, Hamilton, Ayres, and Foster". Journal of Economic Issues. 16 (3): 757–771. JSTOR 4225214. Wood, John (1993). The Life of Thorstein Veblen and Perspectives on his Thought. New York: Routledge. ISBN 0-415-07487-8. Zahavi, Amotz (2010). The theory of signal selection and its implications to theories of indirect selection and altruism (Lecture recording). UCLA. Retrieved 13 February 2015. Wikimedia Commons has media related to Thorstein Veblen. The Veblenite – site dedicated to Thorstein Veblen collecting biography, works, and some analysis. The Island and Thorstein Veblen – Washington Island Chamber of Commerce site on Veblen's summer cabin. IHC Veblen Project – Washington Island Heritage Conservancy site detailing restoration efforts. This page was last edited on 16 April 2019, at 21:00 (UTC).